In previous articles, we have discussed propeller cars (fast, and relatively easy to make – Volume 6, Issue 15), direct drive cars (faster, but more challenging to build – Volume 8, Issue 3), and rocket-powered cars (fastest, but tricky to build – Volume 6, Issue 8). But, today’s topic will be the most challenging of them all, a CO2 cartridge powered car. One of our readers, Rich Cagle, succeeded in building and racing a CO2 car in 2007. This article will detail his design. CO2 cartridges contain pressurized carbon dioxide. When the end of the cartridge is punctured, the gas is released at high velocity, resulting in considerable thrust. Typically, these cartridges are used on cars that are run along a string in a parking lot. A starting mechanism is used to puncture the cartridge to initiate the run. 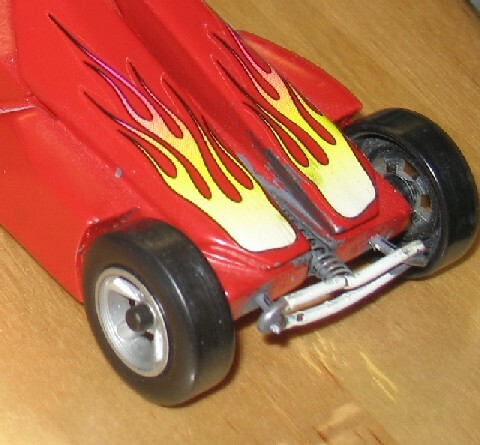 To adapt this technology for use on a pinewood derby track, a mechanism must be developed which will puncture the cartridge when the starting pin drops. Rich solved the starting problem with a “trailer” which contains the puncturing mechanism. The trailer contains a spring and a firing pin. The pin is cocked by pulling backward, and then engaging the pin in a large washer (See Figure 2). The washer is moved downwards by a sharp force, which frees the pin to move forward. This force is provided by a mousetrap mechanism. 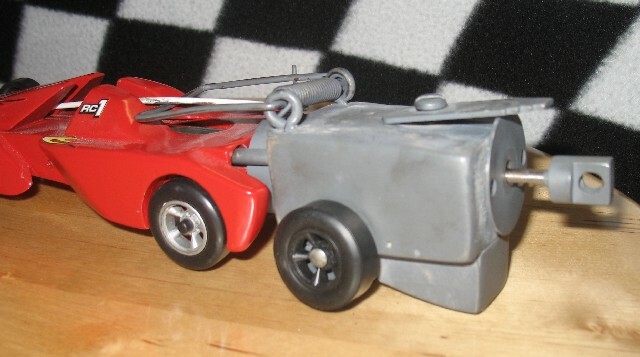 When the mousetrap is released, the trap strikes the plate at the top-rear of the trailer. The plate pushes against the washer, moving it downward and releasing the firing pin. When the cartridge is punctured, the car shoots forward, leaving the trailer to follow at its own pace. The trailer is weighted so that it is not blown backward by the exhaust force. In Figure 2, the mousetrap is armed and ready to fire. Figure 3 shows the trailer in the un-armed position. Notice the sharp pin at the front of the trailer (for puncturing the cartridge), and the position of the mousetrap lever. The mechanism to release the mousetrap is built into the car. A flexible rod (white in the photos) is connected to a spring mechanism on the front of the car (Figure 3). When the spring is relaxed, the rod moves forward on the car. But when the car rests against the starting pin, the rod is pushed backwards. When pushed backward, the rod can latch the mousetrap, and then be lodged under the mousetrap spring (see Figure 2). When the starting pin drops, the rod moves forward, which frees the mousetrap to start the firing sequence. A 12 gram CO2 cartridge is used, which discharges at roughly 900 PSI. The CO2 cartridge is angled in the car to create some down force, keeping the car on the track. When the starting gate drops, the car is tough to see (it finishes the track in about 0.5 seconds) – you hear it more than you see it. To stop the car, a folded blanket was placed at the end of the track. The previous track record was held by a compressed air pop bottle car. That car did not even get out of the gate before this car finished. In its first race the exhaust blew a competitor’s car off the track onto the floor! Oops… (Sorry, no video). Safety was a huge concern. I tested the car to see if it would take flight by firing it in the air off of a ramp; it always spun and flew to the ground. To take no chances I had the entire crowd stand behind the starting gate. I also warned kids and parents how the car was powered and that it was not a toy. Please caution anyone building one of these to think safety first. Don’t take chances, especially with kids around. Building this car with my six year old was a lot of fun, and many lessons were learned. I hope this is something your readers will enjoy. After seeing this car, I decided to build my own version. But I thought it would be great to not have the trailer. So I built a CO2 car with a self- contained mechanism – just this week I got the car working. Next season I’ll include an article about that car, explaining some of the pitfalls, design considerations, and other lessons learned. 1All of the photos in this article were shot by Rich Cagle. We came up with the idea for a Wrench car last year and decided to make it a reality. 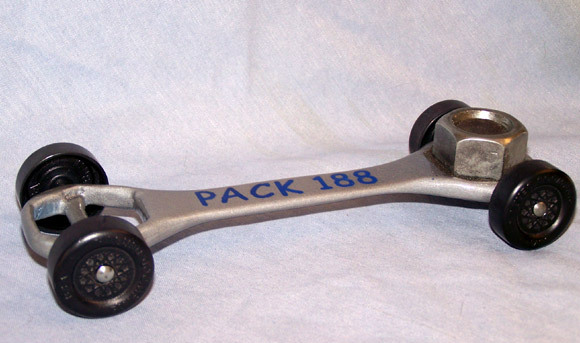 The nut is a 1 1/8″ nut from a towing ball. It is set on top of Tungsten Putty. To reach five ounces, we added Tungsten beads inside the nut. At the race, the Wrench car won 1st in Den, 1st in Pack and Most Original in the design category. 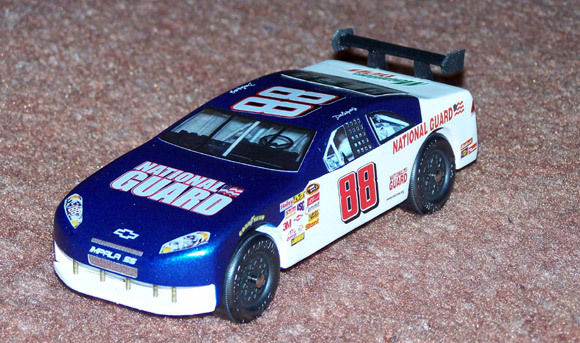 The NASCAR COT (Car of Tomorrow) pinewood derby cars take a little more prep work than the old style NASCARs, but I think this one turned out really nice. My first derby was in 1975 in the basement of our church and the track seemed larger than life. I had never won anything in all of my 8 years until that day. This was back in the day when the kits required that you glue a wood axle in place and nail the brads into the wood axle. 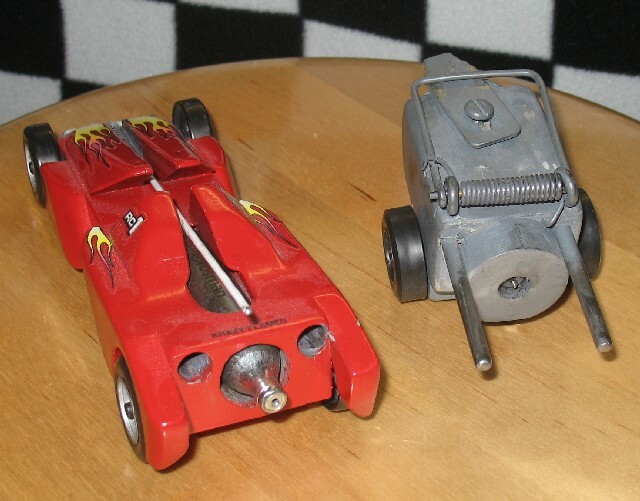 The wheels were different too, they were harder plastic and shaped differently. Dad had done a lot of the work on the car, but it was the first time he ever let me use the scroll-saw. Thinking back, using that tool was like a right of passage into young manhood. I chose the color (royal blue to match my uniform), and Dad said that it would look cool if we added some silver pinstriping to it. He helped me tape it off, then I got to work with my brush (to this day, I think the three coats of blue forced him to remove some of the weight). When we were all done, he told me that we needed to use this stuff called graphite to lubricate the wheels (it was in an enormous plastic bottle, not like what you buy today). Back at the church, I remember that there were balloons, decorations and snacks; it seemed like a really big deal. In the first heat, my car finished car-lengths in front of everyone else, but I didn’t watch because I was so nervous. From that moment on, my buddies wouldn’t let me watch because we all thought it would be bad luck if I did. In the end, my car took first place. I still have the car and the trophy, but mostly I remember the song we sang; I still sing it today with our Pack at every derby. How important is wheel bore and axle diameter? An axle that fits the wheel without excess slop. That is why BSA wheels work best with oversized axles, such as our 4051-Pro-Stainless Steel Axles, or Awana Axles. Both of these are several thousandths larger in diameter than stock BSA axles. The smallest possible bore. This is something that is not easy to control on kit wheels. But it explains why our Needle Axle Outlaw wheels are faster than our regular Outlaw Wheels. The bore on the Needle Axle Wheels is much smaller than on the regular Outlaw Wheels, thus the Needle Axle Wheels are faster. I have a question about COG. My kids will be racing on a “ramp only” track. Do you know what COG should be used to achieve the best possible times? Also, when I’m measuring for COG, I measure from the center of the wheel bore. Is this correct? If the track is truly a ramp only track — no flat section, and the starting angle equals the ending angle — then the COG should be centered between the front and back axle (to equalize the load between the front and back axle). The COG is measured from the center of the bore (or from the center of the axle).